ANOTHER late Newsletter - apologies. But we're still in time (just) to remind you about our Christmas Party on 7 December (see the Programme on page 7) and to ask you to bring, not just a flowerpot (don't ask me, I just write what I'm told) but also a little something, if you can, for our traditional American Supper. With Christmas in mind, we can report that our Christmas 'At Home' on 26/27 November was very successful. Held, as in previous years, to raise money for the Wildlife Trust, the University of Withywood and M.V.C.G., our share of the takings was a splendid £128.83. Many thanks to all who came and supported the event, and special thanks to Chris and Mike Lillington who kindly hosted it this year. As the year approaches its end, we are starting to think of our A.G.M. in February. One aspect of that is our ENVIRONMENTAL AWARDS which we give for any positive change in the public face of BS13 - that can mean a new building, a new use for an old building, a new or improved open space, or anything, large or small, which makes our part of Bristol a nicer place to live in. If you have any ideas for anything which deserves an award and which happened in 2004, please let any Committee member know. BACK IN MARCH, we reported on plans for the path through Crox Bottom. The City Council Cycling Team wanted to widen it to 3 metres, which both we and other Council departments thought would be an unnecessary intrusion. A compromise was arrived at, to widen it to 2.75m. Then everything went quiet. Now the Cycling Team have been in touch to let us know what is proposed, and they have sent us copies of the agreed plans. These were available for members to inspect at the reorganised meeting on 18 November (see page 7). Having lost the principle of widening, we feel that there are some useful silver linings to this cloud. There will be a fence at the southern end of the path (the Hengrove Way end) to prevent unauthorised vehicular access. The fence will be metal railings 1.2m (four feet) high, across the narrow section between the B.T. yard and the fencing for the Wills Office site. There will be a ditch in front of the fence to stop unpleasant people from driving stolen cars straight through it. This should remove the problem of abandoned and burntout cars in Crox Bottom which we have suffered from in recent months. The other good news is that Bristol Parks have suggested an interpretation plan for the area, perhaps including artwork, seating and a gateway feature. We would welcome this and look forward to being involved in discussions. If you have any thoughts about what could be included, please let me know. The planning application for the new Withywood Centre on Queens Road was approved by the City Council on 13 October. We spoke against it, not because we are opposed to the principle, but because we wanted a better building. One councillor voted against the application. You may have seen in the Evening Post that work started prematurely on the Esso garage site on Bishopsworth Road. 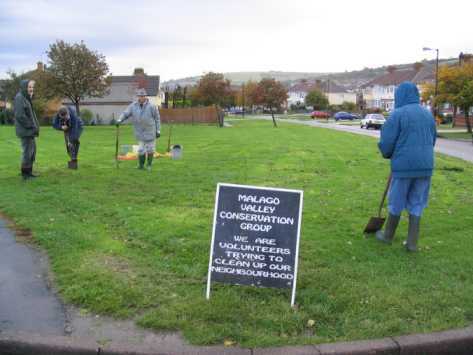 Cllr Richard Eddy copied to us an e-mail which indicates that the site has changed hands, and the new owners were starting work when the planning permission was still incomplete - agreement has to be reached on landscaping and other matters. THE PATH from the Pond to the Interceptor alongside the river in Manor Woods has at last been cleared! After months of persistent nagging from us, the intrepid team from the contractors, Continental Landscapes (armed, no doubt, with compass, map and tools) have cleared a four foot wide path through the brambles, nettles and the dreaded Japanese Knotweed. We are calling on all suitably booted fans of this little walk to use it through the winter so that it doesn't vanish from the Council's sight or maintenance list again. The kingfishers and grey wagtails love it, by the way! Another bit of Manor Woods has also been brought up to scratch following gentle pressure from us: the 'pergola' entrance feature at Vale Lane has now been fully repaired after the top timbers were broken some time ago. And speaking of Japanese Knotweed ... Julian Cox, our Community Parks Manager, has suggested that M.V.C.G. members could provide a useful service by helping to control the knotweed in Manor Woods. There are strict regulations to prevent the spread of this pernicious plant, so it isn't a freelance job. It's illegal to transport any part of the plant, so the proposal is that we have a working party in the New Year to bash down the stems (very satisfying!) and then burn them in a controlled way on site. 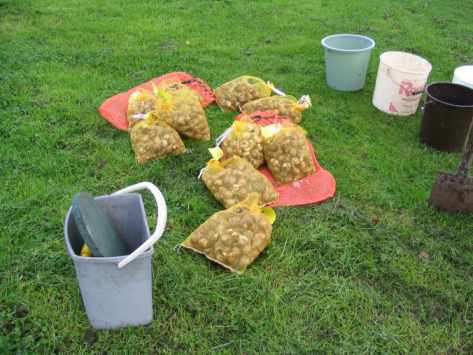 This will help weaken the plants so that they will be more easily controlled by the Council applying suitable treatment in the spring. The January Newsletter should have details of a 'knotweed bashing' date - or get in touch if you'd like to be notified about it. More New Year activity to walk off the Christmas pud ... Bristol Living Rivers are organising a survey of shopping trolleys dumped in our watercourses and we have said that we will survey the Malago and Pigeonhouse in our area. This will be in January. Again, let me know if you are interested. If there is time, more information will appear in the January Newsletter. 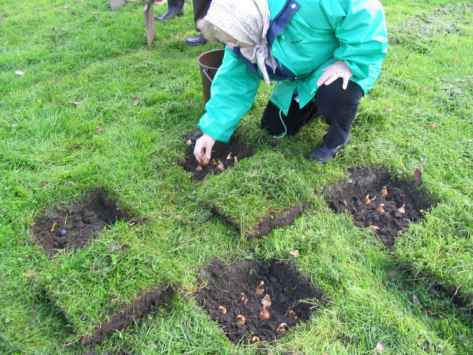 THE WEATHER wasn't too clever when we started our annual planting of daffodil bulbs on 16 October, but the drizzle stopped after a bit, and our usual efficient hole digging, planting and filling got the job done in an hour and a bit. The location this year was the triangle of grass at the top of King Georges Road where it meets Highridge Road. 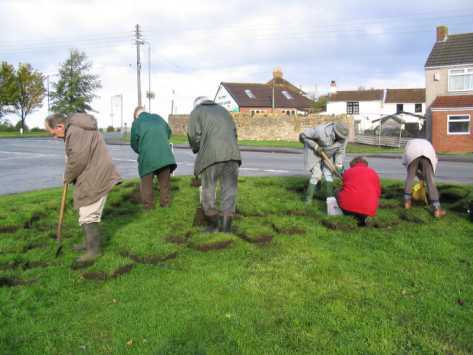 We planted the bulbs in an arrow-head shape, the rounded point facing Highridge Common and the two 'barbs' of the arrow tailing back along Highridge Road and King Georges Road. It should look good when the spring comes! We were approached during the planting by Sharon and her daughter who live near by. We were delighted to answer a few questions about what we were up to for the school newspaper - and Sharon is now helping with our collection of cans for recycling into next year's daffodils. ON 19 OCTOBER, Mark Rooney came to talk to us about an innovative scheme to involve young people in taking an active part to improve their surroundings. He led a group of 12 youngsters from Hartcliffe and Withywood, Withywood school being a prime source for the candidates. Over a period of two years the young people travelled to sites in Glasgow and Birmingham to see the parks that had been created in those areas. The idea was to gain knowledge to equip them to plan a park for Hartcliffe. They also learned how to go about obtaining funding by means of grants. They entered into it with a great deal of enthusiasm, but we all felt that having Mark as their mentor was a prime factor in the success of the scheme. The media took a great deal of interest, Radio Bristol frequently airing slots in which members of the group were interviewed. Work started on the site in Hareclive Road in the summer. Mark showed us many photographs of the area as progress on the park developed. There was a gravelled section where we people could meet for a chat, and a slide built into a mound created by the soil removed when levelling the site. Many trees were planted and new turf laid. Ivy was used as ground cover, being low maintenance and good for wildlife. Mark brought us right up to date with photographs he had taken in the previous few days. It was good to see that everything was almost complete in readiness for the grand opening on 1 November. It is gratifying to know that the scheme has been such a success and involving young people was pivotal in this respect. The Quiz evening on 16 November was the usual fun event, and our two teams enjoyed themselves. Neither 'The Litter Pickers' nor 'The Can Can Girls' disgraced themselves, though there was some slight disappointment in the assembled company when it was pointed out that the Cans referred to the aluminium variety and not to any terpsichorean activity. THE 'WINTER' series of meetings is in full swing, on the third Tuesday of the month, meeting at St Peter's Rooms (by the side of St Peter's Church, Bishopsworth). Tuesday 7 December: M.V.C.G. 's inimitable Christmas Party. The editor wishes to make it clear that he hasn't a clue what is planned, but has been instructed to ask everyone to bring a terracotta flowerpot if they can. The pot should be 10-12cm high (that's 4½") and with a diameter at the top of 9-11cm (4"). And we shall finish with our usual American Supper, so please bring a little something, if you can, to add to the table. Monday 3 January: Garbage Raid. Meet at 3.45pm at the Bishopsworth Library entrance to Manor Woods. Tuesday 18 January: The Buildings of Arnos Vale Cemetery by IZAAK HUDSON of Niall Phillips Architects who are currently working on the restoration of the magnificent listed buildings there. Monday 31 January: Garbage Raid. Meet at Symes Avenue at 3.45pm. Tuesday 17 February: Our A.G.M. and Birthday Party. Our special guest speaker will be SALLY OLDFIELD, who will tell us about Local Nature Reserve status for Manor Woods. More details in the January Newsletter. Our meeting on 18 November was not as advertised. 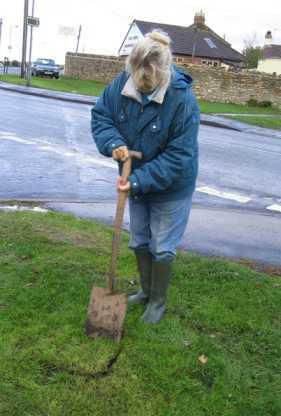 Because of a close family bereavement, Les Davies, the Mendip Warden, had to withdraw at short notice. We send our sympathies, and we look forward to hearing him at a future date. Instead, we had a two-part meeting. The first half was a general discussion of some the issues the Committee are currently working on, such as the Crox Bottom path (see page 2) and Manor Woods (page 3), followed by an updated version of a talk on Lundy which André and Marie Jo Coutanche had previously given to the University of Withywood. The general discussion in the first half seemed to interest most people, and it was very useful for the Committee to get a wider input from our members. We might do it again deliberately! WE reported in the Autumn edition of the Newsletter that a SPARROWHAWK had been observed eating a collared dove in a Bishopsworth back garden. Here's a photo of the dramatic event. 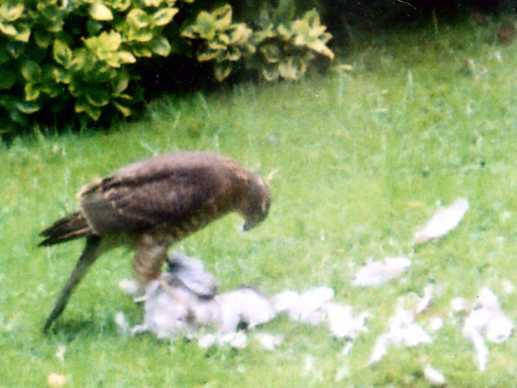 Margaret Swatton reports that she has had a KESTREL operating in her back garden. And André and Marie Jo were leaning on the dam in Manor Woods recently when they became aware of a KINGFISHER minding its own business, perched on the head of a 'bulrush' (reedmace) half-way along the edge of the pond. Clearly visible to the naked eye, it was an absolute treat in binoculars. It stayed there, half-dozing in the winter sun, and half keeping an eye on the water, for ten minutes or more. Tania Case, Valerie Gay, Paul Mizen, Sue Walker, CSV Environment, Cllrs Mark Brain, Peter Crispin, Richard Eddy, Ron Hodges, Helen Holland, Colin Smith, Mary Sykes (All the City councillors for Bishopsworth, Hartcliffe and Whitchurch Park wards are invited to become co-opted Committee members).